Patrick Hurley | That Awesome Theatre Blog! There are very few movie musicals that are so well-written, solidly structured and infused with such joy that a mere re-creation on stage almost seventy years later actually works. Singin’ In the Rain, playing now at La Mirada Theatre for the Performing Arts, is such a show. Falsettos Does Set Oh So Typical Standards. 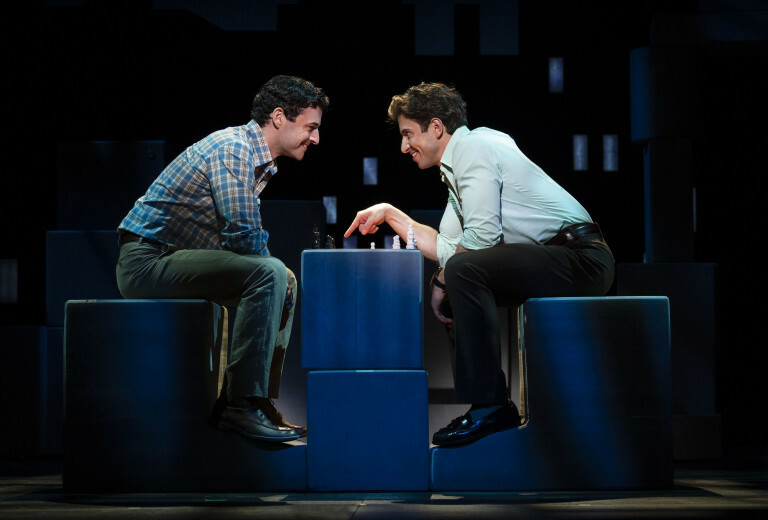 In the pantheon of Musical theater, where originality has been ebbing farther and farther away from the reboot, remake, revival culture that is Broadway- we find ourselves, quite inexplicably, stranded on the nearly three-hour island that is Falsettos, playing now at the Ahmanson. The intersection between past and future, between meaning and chaos- all the lingering inertia that implies a sense of false permanence and comfort come together in the telling of Joan Didion’s masterwork, “The White Album,” a seminal essay that deals with the struggles, both visceral and cultural, that defined a generation of Americans, and gives voice to the uncertainty, the freedom, and the impossible thrust toward more progressive modernity. The time was the late 1960s, the place was Los Angeles and the voice was Joan Didion. CAP UCLA in association with Center Theatre Group presents the essay as a performance piece created by Lars Jan/Early Morning Opera. One could call it an exercise in theatrical scaling-down, as if the piece were literally and figuratively constricting itself and its characters as it moves along, tightening its grip until at last, nearly out of breath, it culminates in a final claustrophobic moment. Shakespeare’s Othello, playing now at A Noise Within, is yet another example of the bard’s brilliance for metaphor and symbolism and is one of his more accessible tragedies. Nearly twenty years after its premiere, Matthew Bourne’s dazzling production of Cinderella once again graces the stage of the Ahmanson theatre. The piece, like the choreographer/director himself, is still going strong, and is a great testament to the power of storytelling. The responsibility that we all have as human beings toward our fellow human beings is illuminated and exaggerated into the dark parable An Inspector Calls playing now at the Wallis Annenberg Center for the Performing Arts. Written by J.B. Priestley in 1945, and set in a fictional British town in 1912, the story takes place in real time as the wealthy Birling family is visited by a mysterious inspector who informs them that a young woman has committed suicide and they all may have had a role to play in it. There’s Not Much Substance There For Hir.